Nearly wiped out 100 years ago, the Eastern Shawnee tribe based near Seneca is now thriving, thanks in no small part to the first female Chief in tribe history. The Eastern Shawnee Tribe of Oklahoma’s administrative offices sit on a 60-acre tract of land just west of Seneca, Missouri. The minute you cross into the office parking lot, you’re in Oklahoma’s Ottawa County, which nine federally recognized tribes call their home—the most in any single county in the United States. The acreage is empty most of the year. Only the tribe’s administrative offices call it a permanent home, although it does include the wide-open powwow grounds and a former casino. But on certain weekends, the grounds come alive with traditional dances and hundreds of members reuniting to share their ancient roots. The Eastern Shawnee are not a numerous people, but they are growing, numbering more than 3,100 today. There are citizens in every state, primarily in the four-state region surrounding their Oklahoma tribal base. It wasn’t always this way. Like most Native American tribes, the 1800s were a near miss with total genocide following the U.S. Government’s Indian Relocation Act of 1830 and the tribe’s forced relocation from the woodlands of Ohio in 1832 (an event that predates the more famous Cherokee Trail of Tears by six years). The Eastern Shawnee made the trek on foot with eight other Ohio tribes, eschewing speedier steamboats and even the simplest comforts because of the fear of smallpox blankets and steamship fires. On the 700-mile journey, the Eastern Shawnee lost 30 percent of their members but eventually made it to northeastern Oklahoma. Over the next century and a half, the tribe continued to dwindle, and its culture diluted. The population bottomed out around the turn of the 20th century with just 69 living members. The language and tribal ceremonials were lost completely. Anglicized names were given to families and children, making it impossible to trace ancestry. Even as recently as a few decades ago, children were urged not to talk about going to Native activities or ceremonies at school. But the tribe has rebounded, adding the bulk of its 3,100 members over the last couple of decades after a constitutional reorganization in 1994 allowed Eastern Shawnee citizens living in other states—many of whose families left in the 1930s to pursue work during the Oklahoma Dust Bowl—to be counted as citizens. The tribe now has three branches of government, a sophisticated election system that includes absentee voting for out-of-state citizens, and a primary elected leader, a Chief. And for the first time ever in 2006, the tribe elected a woman to serve in this position. Meet Chief Glenna J. Wallace. 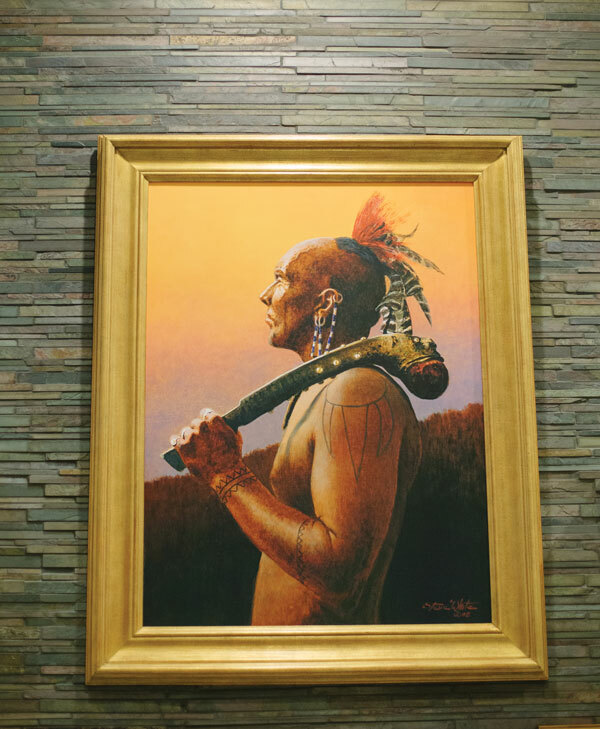 Paintings at Indigo Sky Casino and Hotel include everything from male warriors (pictured) to a variety of other compositions that are representative of the Eastern Shawnee culture. 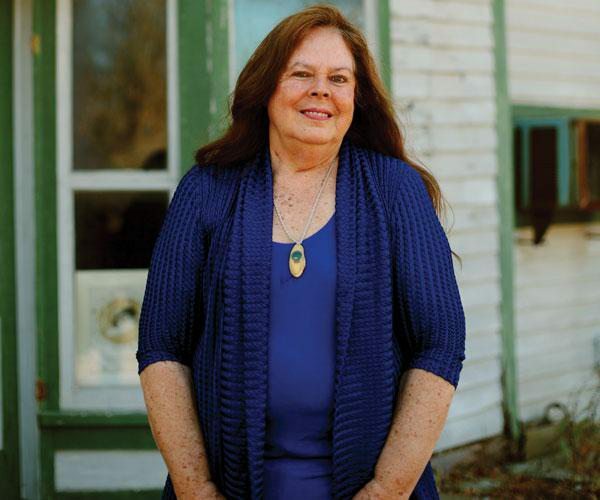 Chief Wallace—or Chief Glenna, as she is typically called—has gained notoriety for not only being the first female Chief in Eastern Shawnee history (one of only a handful in all of Oklahoma) but also for helping expand important programs that have transformed the Eastern Shawnee, particularly in the area of education. For this work, as well as other community activities—she has served on the Seneca school board and chamber of commerce, and has been active with Habitat for Humanity among many other involvements—she earned the Missourian Award in 2013, which goes to individuals who have made great contributions to their communities in the areas of civics, business, arts or politics. When the family returned, still broke, to Oklahoma, her father was in the hospital with tuberculosis of the spine, and a pre-teen Wallace swore she would have options in her life. And an education was the only way she knew of for a girl in her position to have them. She was the first female in her family to graduate from high school, and the first person in her family to go to college. She soon married, and she continued studying, even with three children at a time when women were still expected to stay home. She started earning three degrees from Pittsburg State University. In 1968, she took a job at nearby Crowder College, where she taught for 38 years and wound up chairing the communications department. It was the study of language—she originally went to school to study Spanish—that led her back to her Native American roots. As she dug deeper, she discovered more than half of the tribal chiefs since the early 1900s were her ancestors. She became more active with the tribe over the years, joining the governing Business Committee in the 1990s. Upon retiring from Crowder in 2006, she ran and was elected as the tribe’s first female Chief. Glenna Wallace’s grandson, Skylar Wallace, received a scholarship from the Eastern Shawnee tribe and attended William Jewell College. He currently works as a lending officer at People’s Bank of Seneca. It’s no accident that Wallace, a lifelong educator, was chosen to lead the Eastern Shawnee. The tribe’s leaders put a major emphasis on education, and they put their money where their mouths are. Every tribe student—starting in seventh grade and continuing through college—earns a financial reward for carrying an A or B average. The tribe also reimburses up to $750 annually for high school juniors and seniors to help cover expenses associated with late high school, from graduation announcements to class rings and prom dresses. This is in addition to a $750 annual clothing reimbursement available to all Eastern Shawnee citizens, as well as significant medical and cost-of-living reimbursements to tribal elders older than 62. Scholarships are perhaps the biggest part of the equation: When Eastern Shawnee students goes to college, the tribe gives each and every one of them $4,000 per semester to help with college expenses—typically tuition, books and room and board. These benefits—which have been increased significantly in recent years under Wallace’s watch—are generous for modern Native American tribes, many of whom earn impressive profits from their casino businesses. The Eastern Shawnee own and operate the Indigo Sky Casino and Hotel, located only a couple of miles from the Seneca offices. 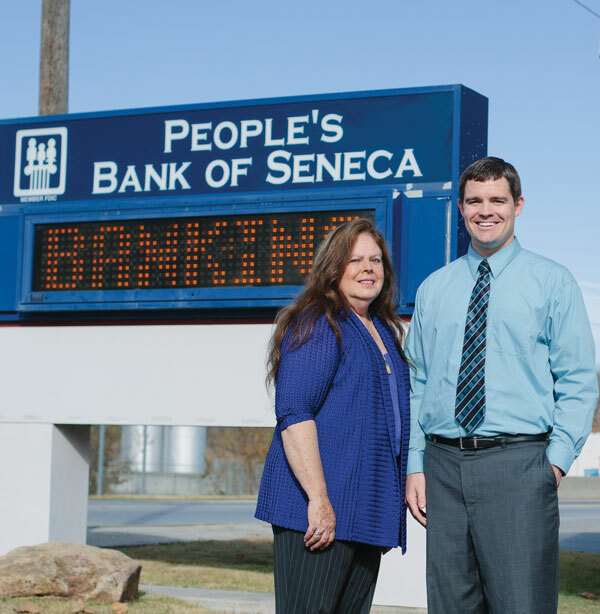 The Eastern Shawnee also own a 57 percent stake in the People’s Bank of Seneca, for which Wallace is a longtime board member. Wallace estimates that, as of the fall 2013 semester, some 400 of the Eastern Shawnee tribe’s 3,100 members receive academic financial benefits, 236 of them via scholarships. Wallace says the benefits are starting to pay off for the tribe, and not only in satisfaction of watching youth succeed. The tribe’s full-time attorney is an Eastern Shawnee member who attended school on tribe scholarships, as are a top financial officer and the assistant hotel manager at Indigo Sky. Wallace is visibly proud of the emphasis on education coming back to help the tribe in tangible ways. “Some of these youth are coming back and saying, ‘The tribe has helped me, so I want to help them,’” Wallace says. Every fall, the Eastern Shawnee hold a powwow, a three-day homecoming festival where tribe members from all over the country return to share their culture, mingle and hold annual meetings. More than 200 made the trip in September 2013, the biggest turnout in memory, and for three days, Wallace shook hands, learned names and thanked people—many of whom still live in Oregon and California—for making the trip. Throughout the year, tribal youth activities—dancing, regalia sewing, lacrosse—teach the youngest Eastern Shawnee about the tribe’s traditions and connect them to the elders, many of whom are only now learning to embrace the tribal legacy themselves after years of discrimination and suppressed heritage. And it’s that pride in heritage that will have to keep the tribe alive, because the bloodlines are thinning. Wallace says the Eastern Shawnee lost their only full-blooded American Indian member (called “four-fourths,” fully Native but not fully Eastern Shawnee) last year. These days, it’s rare for an Eastern Shawnee to marry another Eastern Shawnee. The only way to gain membership in the tribe is to be part of an unbroken line of membership succession—which means every current Eastern Shawnee is a descendent of one of those 69 who were left at the turn of the 20th century—so there’s no recruiting based on long-vanished family ties or questionable heritage. And still the rolls are growing, even as the bloodlines fade away. But that is a fact of life for all Native Americans, and Wallace says she wants people to know that the Eastern Shawnee are still here, and thriving. 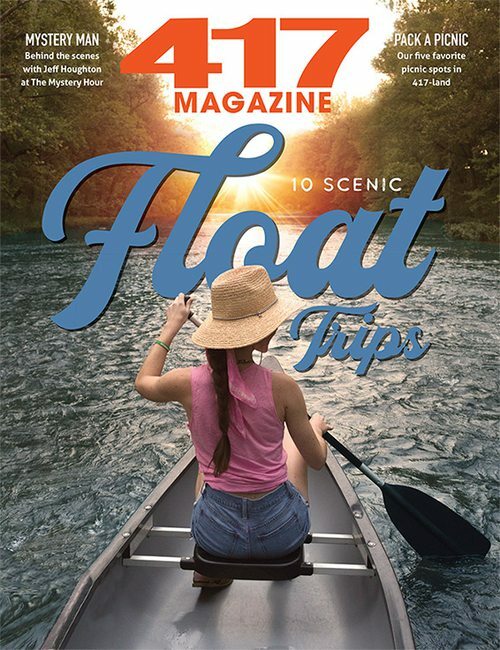 Every month, we introduce you to one of the people who work on 417 Magazine. This month, meet Logan Aguirre. Every month, we introduce you to one of the people who work on 417 Magazine. This month, meet Callie Henry. Every month, we introduce you to one of the people who work on 417 Magazine. 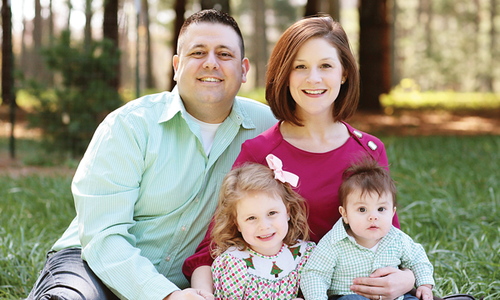 This month, meet Ammie Scott.